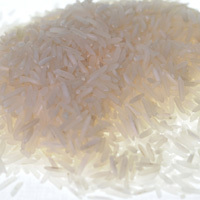 Rice is boiled or fried and eaten as pilafs, paella and many types of risottos. Rice can be eaten cold in salads. Rice or rice flakes are also eaten as desserts. The grains may be puffed to give breakfast cereals. Rice is also ground to make rice flour or powder, which is used in pastry, cakes and biscuits. Rice allergy seems uncommon in Europe or America but the reported symptoms have involved the skin (urticaria), respiratory symptoms (asthma), gastrointestinal symptoms (nausea) and anaphylatic shock, sometimes induced by exercise. Rice allergy is reported as more common in Japan and has been associated with atopic ezcema. Rice and rice flour can be eaten by individuals with wheat allergy or coeliac disease. Immediate nausea, abdominal pain and diarrhea were experienced in a 9 year old girl after ingestion (Orhan and Sekerel, 2003 ). She also suffered from urticaria-angioedema after inhalation in a kitchen as rice was being prepared. Fiocchi et al. (2003)  report a case of a boy with atopic dermatis who at age 6 showed a positive response, eczema after 24 hours, on rice DBPCFC. At age 8 he suffered a severe anaphylatic reaction, cardiopulmonary collapse and generalized urticaria, following inhalation of rice. At age 11, he was tolerant to ingestion by DBPCFC but double blind challenge by inhalation caused a urticarial rash and laryngeal stridor. Rhinitis, itching of the scalp and asthma initially with acute urticaria on subsequent exposure and dyspnea in a single patient (Wütherich et al. 2002 ). Single cases of rice dependent exercise induced anaphylaxis are described by Guinnepain et al. (1996)  and Caffarelli et al. (1997) . Romano et al. (2001)  also noted one case with symptoms with rice. Intestinal symptoms and dyspnea after consumption of rice in a single patient (Musken et al. 1991 ). Atopic dermatitis due to rice has been reported (Uenishi et al (2003) ; Ikezawa et al 1992 ; Uehara et al 1992 ). These are not included in the number of cases above because only some of the >1000 cases were associated with rice and the involvement of IgE mediated hypersensitivity is not clear. Commercial extract (Fiocchi et al. 2003) . Commercial extracts (two suppliers) and prick-prick with cooked rice (Wütherich et al. 2002 ). Orhan and Sekerel (2003) , Fiocchi et al. (2003) , Wütherich et al. (2002) , Arai et al (1998) , Caffarelli et al. (1997)  and Musken et al. (1991)  each tested one patient. Romano et al. (2001)  tested 54 patients. Varjonen et al. (1995)  tested with rice 16/34 children with atopic dermatitis who already had given a positive SPT with wheat. Strongly positive wheal and flare reaction was observed to rice and not to wheat, barley, oat and lentil or common aeroallergens both with extracts and prick-prick tests (Orhan and Sekerel, 2003 ). Fiocchi et al. (2003)  report positive skin prick test results for a boy for rice and peanut at age 6 (3 mm and 4 mm diameter wheals respectively) and at age 8 (6 and 4 mm diameter wheals respectively). A single patient had a positive prick-prick test with cooked rice, and a commercial extract (Bencard) but negative SPTs with common inhalant and food allergens (Wütherich et al. 2002 ). Romano et al. (2001)  found that 28/54 patients were SPT positive to rice. Caffarelli et al. (1997)  report a positive SPT for rice and peanut in a single patient. Some correlation was seen between the wheal sizes for wheat and rice in the children with atopic dermatitis. 11/16 children gave positive SPTwith rice (Varjonen et al. 1995) . Musken et al. (1991)  reported an individual had a positive prick-prick test with both raw and cooked rice. CAP-FEIA (Orhan and Sekerel, 2003 ; Fiocchi et al. 2003 ; Wütherich et al. 2002 ; Romano et al. 2001 ; Caffarelli et al. 1997 ). Shibasaki et al. (1979) , Musken et al. (1991)  and Urisu et al. (1991)  used RAST. Orhan and Sekerel (2003) , Fiocchi et al. (2003) , Wütherich et al. (2002) , Arai et al (1998)  and Musken et al. (1991)  each used sera from 1 patient. Guinnepain et al. (1996)  used sera from 1 patient with food dependent exercise induced anaphylaxis. Urisu et al. (1991)  and  used sera from 31 rice allergic individuals. Limas et al. (1990)  used sera from 4 patients suspected of allergy to cereals. Matsuda et al. (1988)  used sera from 3 rice allergic individuals. Shibasaki et al. (1979)  used sera from 6 rice allergic individuals. The total IgE concentration was 165 kU/l, and rice specific IgE (CAP-FEIA, Pharmacia, Uppsala, Sweden) was 13.2 kU/l (Class 3) (Orhan and Sekerel, 2003 ). A CAP class 4 was obtained to both rice and peanut at age 6 in the patient of Fiocchi et al. (2003) . At age 8, specific IgE to rice was 18.50 UI/mL. The total IgE concentration was 55 kU/l, and IgE specific to rice (CAP-FEIA, Pharmacia, Uppsala, Sweden) was 4.6 kU/l (Class 3) (Wütherich et al. 2002 ). Romano et al. (2001)  found that 24/54 patients were CAP positive to rice (32 were either CAP or SPT positive). Caffarelli et al. (1997)  found a single patient had a positive CAP for rice and peanut. Guinnepain et al. (1996)  reported a specific IgE of 16.4 kU/l for rice in a single patient. Urisu et al. (1991)  found that sera from 31 patients which showed positive RAST values for rice grain extract were also RAST positive for RP16KD. In 17 subjects leukocyte histamine releases was also triggered by RP16KD. Musken et al. (1991)  reported a positive RAST with raw rice but negative with cooked rice in a single patient..
Limas et al. (1990)  reported the 4 sera gave positive RAST (class 2-4). Matsuda et al. (1988)  reported IgE binding to a purified 16 kDa protein, RAP, by ELISA using each serum at 4 dilutions (1/100 to 1/800). Shibasaki et al. (1979)  investigated the lymphocyte-stimulating properties of rice glutelin and globulin fractions. All fractions were found to be reactive with specific IgE antibody, and two of three fractions from gel filtration revealed lymphocyte-stimulating activity. RAST inhibition revealed considerable cross-reactivity of IgE antibody with the glutelin and globulin fractions. Immunoblotting separation:Usui et al. (2001)  ground samples of each rice tissue (seeds, stem and leaves) to fine pieces in a blender and suspended them in 10 ml/g phosphate buffered saline containing 5mM EDTA and 1mM phenylmethylsulfonyl fluoride. After being kept at 4°C with gentle shaking for 14h and treated with ultrasonication for 1min on ice, the tissue sample was passed through a piece of gauze and centrifuged at 15,000×g for 15min. The supernatant was dialyzed against distilled water and then freeze-dried. The crude extracts and purified proteins were separated by SDS-PAGE, 12% acrylamide, under reducing conditions. Limas et al. (1990)  defatted rice endosperm with petroleum ether and extracted the flour with chloroform/ethanol (2/1, v/v). The dried residual flour was extracted with 0.5 M NaCl (2 X 10 volumes, 1 hour, 4°C) and proteins precipitated with trichloracetic acid (to 15%). The precipitate was washed with cold acetone and dried. Samples of this extract and of purified proteins were separated by 1-D SDS-PAGE. Usui et al. (2001)  transfered proteins by electrophoretic blotting onto a polyvinylidene difluoride membrane. After being blocked with 1% polyvinylpyrrolidone (Mr 40,000) in phosphate buffered saline (PBS) or 3% BSA in PBS, the membrane was incubated with serum 8 times diluted with 1% BSA in PBS, at 20 °C for 3 h. The membrane was washed with PBS with Tween 20 and incubated with peroxidase-labeled anti-human IgE diluted with 1% BSA in PBS. Activity staining for peroxidase was done with either an enhanced chemiluminescence (ECL) detection kit (Amersham Pharmacia) or 4-chloro-1-naphthol. Limas et al. (1990)  transfered proteins by electrophoretic blotting onto two nitrocellulose sheets. The sheets were incubated in 20 mM Tris/HCl buffer, pH 7.5, 500 mM NaCl, 0.5% (w/v) BSA and 0.5% (v/v) Triton X-100 (TBS-T) for 2 hours. The sheets were then shaken overnight with pooled sera from the 4 patients (1:9 diluted in TBS-T) and then washed with TBS-T for 30 minutes. One sheet was shaken for 3 hours with 1:4000 diution of anti-human IgE labelled with alkaline phosphatase followed by 4 washes with TBS-T. Binding was revealed with 5-bromo-4-chloro-3-indolyl phosphate p-toluidine salt and p-nitro blue tetrazolium chloride (30 minutes, room temperature). The second sheet was incubated with iodine 125–labeled anti-human IgE antiserum diluted 1:5(v/v) in TBS-T for 10-18 hours and then washed four times as above. The dried nitrocellulose was exposed on autoradiography film for 10-15 days. Immunoblotting results:Fiocchi et al. (2003)  report that immunoblotting with rice showed an IgE binding 16-kDa (suggested to correspond to a member of the alpha-amylase/trypsin inhibitor protein family) and a 25-kD protein band. Usui et al. (2001)  identify the 33-kDa allergen, Glb33, as a glyoxalase I. Recombinant Glb33 was shown to be as reactive as the native Glb33 with mouse IgG and patients' IgE antibodies to Glb33. Glb33 was also shown to be expressed in seeds, stem and leaves using a mouse monoclonal antibody. Ikezawa et al. (1992)  note as unpublished data that the 16 and 50 kDa allergens are frequently detected as allergens by immunoblotting. Urisu et al. (1991)  reported IgE binding to proteins of 14-16, 26, 33 and 56 kDa. The 14-16 kDa proteins were shown to be a family of alpha-amylase/trypsin inhibitors (Nakase et al. 1995 ). Musken et al. (1991)  reported IgE binding to allergens of 14.4 and 28 kDa. A band at 45 kDa was also seen with long grain rice. IgE bound to an IEF band at pH 6.45-6.55. Limas et al. (1990)  reported IgE binding to an unidentified protein of 12.5 kDa and to the rice alpha-globulin (28 kDa observed). Both proteins were purified and shown to bind IgE but both had blocked N-termini. The purified rice alpha-globulin was identified from its amino acid composition. Not described for oral challenges. Fiocchi et al. (2003)  described the inhalant challenge. They extracted rice and wheat proteins in phosphate buffered saline in an agitator for 60 hours at 4°C. The samples were centrifuged at 2500 rpm for 15 minutes and the supernatant dialyzed against deionized distilled water for 24 hours at 4°C. The resulting solutions of 1 mg/mL were used to prepare incremental doses of rice and wheat of 0.0625, 0.125, 0.25, 0.50, and 1 mg/mL in a saline vehicle. Placebo and allergen doses were planned for separate days over 5 hours at hourly intervals. The inhalation provocation tests were performed through use of a nebulizer attached to a dosimeter. The solutions were administered at room temperature as aerosols. Orhan and Sekerel (2003) ) and Fiocchi et al. (2003)  were double blind. Arai et al (1998)  was open. 300 g gave positive response (Arai et al 1998 ). Fiocchi et al. (2003)  reported a positive response to the second dose of aerosol (a cumulative dose of 0.085 mg). Orhan and Sekerel (2003)  did not report a dose. Nausea after 10 minutes, abdominal pain and diarrhea in a 9 year old girl (Orhan and Sekerel, 2003 ). Fiocchi et al. (2003)  report a positive response, eczema after 24 hours, on rice DBPCFC in a 6 year old boy. At age 11, he was tolerant to ingestion by DBPCFC but double blind challenge with rice as an inhalant caused a urticarial rash and laryngeal stridor. Wheezing (Arai et al 1998 ). The patient could tolerate hypoallergenic rice (Watanabe et al. 1990 ). Musken et al. (1991)  reported a positive challenge with rice. Lehrer et al. (1999)  reported significant correlations between specific IgE to rice and to corn (maize) with r = 0.95 and to soy with r = 0.81 over 123 sera. IgE cross reactivity with other cereals has been observed but without clinical symptoms (Yamada et al. 1995 ). Varjonen et al. (1995)  also reported a correlation between SPT results for wheat and rice in children with atopic dermatitis. Atopic dermatitis due to rice has been reported and RAST has shown a correlation with specific IgE to rice extract especially for severe cases (Ikezawa et al 1992 ; Uehara et al 1992 ; Uenishi et al 2003 ). The complex relationship between food allergy and atopic dermatitis has been reviewed by Sampson (2003) . Rice has been reported as a contact and inhalant allergen. The pollen also includes an allergen, Ory s 1, which is an expansin-like protein. Cavataio et al. (1996)  and Giombetti and Schwartz (1999)  describe reactions to ingestion of rice that may not involve IgE. Sicherer et al. (1998)  describes a delayed reaction to rice. Immediate hypersensitive reactions to buckwheat ingestion and cross allergenicity between buckwheat and rice antigens in subjects with high levels of IgE antibodies to buckwheat. Watanabe M, Miyakawa J, Ikezawa Z, Suzuki Y, Hirao T, Yoshizawa T, Arai S.
Production of hypoallergenic rice by enzymatic decomposition of constituent proteins. Uenishi T, Sugiura H, Uehara M.
Role of foods in irregular aggravation of atopic dermatitis. Uehara M, Kimura C, Uenishi T.
Type I allergy to foods in atopic dermatitis. Comparison between RAST-positive and RAST-negative cases. Ikezawa Z, Miyakawa K, Komatsu H, Suga C, Miyakawa J, Sugiyama A, Sasaki T, Nakajima H, Hirai Y, Suzuki Y. A probable involvement of rice allergy in severe type of atopic dermatitis in Japan. Sicherer SH, Eigenmann PA, Sampson HA. Clinical features of food protein-induced enterocolitis syndrome. Caffarelli C, Cataldi R, Giordano S, Cavagni G.
Anaphylaxis induced by exercise and related to multiple food intake. Guinnepain MT, Eloit C, Raffard M, Brunet-Moret MJ, Rassemont R, Laurent J.
Exercise-induced anaphylaxis: useful screening of food sensitization. Arai T, Takaya T, Ito Y, Hayakawa K, Toshima S, Shibuya C, Nomura M, Yoshimi N, Shibayama M, Yasuda Y. Bronchial asthma induced by rice. Cavataio F, Carroccio A, Montalto G, Iacono G.
Isolated rice intolerance: clinical and immunologic characteristics in four infants. Wüthrich B, Scheitlin T, Ballmer-Weber B. A case of isolated rice allergy. Urisu A, Wada E, Kondo Y, Horiba F, Tsuruta M, Yasaki T, Yamada K, Masuda S, Komada H, Yamada M, et al. Rice protein 16KD--a major allergen in rice grain extract. Shibasaki M, Suzuki S, Nemoto H, Kuroume T.
Allergenicity and lymphocyte-stimulating property of rice protein. The evaluation and management of food allergy in atopic dermatitis. Fiocchi A, Bouygue GR, Restani P, Gaiaschi A, Terracciano L, Martelli A.
Anaphylaxis to rice by inhalation. 16-kilodalton rice protein is one of the major allergens in rice grain extract and responsible for cross-allergenicity between cereal grains in the Poaceae family. Nakase M, Adachi T, Uris A, Miyashata T, Alvarez AM, Nagasaki S, Aoki N, Nakamura R, Matsuda T.
Rice (Oryza sativa L.) alpha-amylase inhibitors of 14-16kDa are potential allergens and products of a multigene family. Matsuda T, Sugiyama M, Nakamura R, Torii S.
Purification and properties of an allergenic protein in rice grain. Romano A, Di Fonso M, Giuffreda F, Papa G, Artesani MC, Viola M, Venuti A, Palmieri V, Zeppilli P.
Food-dependent exercise-induced anaphylaxis: clinical and laboratory findings in 54 subjects. Ikezawa Z, Ikebe T, Ogura H, Odajima H, Kurosaka F, Komatu H, Sase K, Suga C, Sugiuchi M, Suguro H, et al. Mass trial of hypoallergenic rice (HRS-1) produced by enzymatic digestion in atopic dermatitis with suspected rice allergy. HRS-1 Research Group. Lehrer SB, Reese G, Malo JL, Lahoud C, Leong-Kee S, Goldberg B, Carle T, Ebisawa M.
Corn allergens: IgE antibody reactivity and cross-reactivity with rice, soy, and peanut. Rice allergenic protein and molecular-genetic approach for hypoallergenic rice. Usui Y, Nakase M, Hotta H, Urisu A, Aoki N, Kitajima K, Matsuda T.
Varjonen E, Vainio E, Kalimo K, Juntunen-Backman K, Savolainen J.
Skin-prick test and RAST responses to cereals in children with atopic dermatitis. Characterization of IgE-binding components in wheat and oats by an immunoblotting method. Limas GG, Salinas M, Moneo I, Fischer S, Wittmann-Liebold B, Mendez E.
Purification and characterization of 10 new rice NaCl-soluble proteins - identification of 4 protein-synthesis inhibitors and 2 immunoglobulin-binding proteins. Process, chemical, enzymatic:The stability to heat and proteases of rice alpha-globulin has not been reported but it retains IgE binding activity after denaturation during the purification. The disulphide linked alpha-helical structures of this protein family are generally found to be very stable. Cross-reactivity with proteins from other plants has not been reported. The most similar protein is the alpha-globulin from maize (51% identical). Allergen properties & biological function:Seed storage globulin. Limas et al. (1990)  defatted rice endosperm with petroleum ether and extracted the flour with chloroform/ethanol (2/1, v/v). The dried residual flour was extracted with 0.5 M NaCl (2 X 10 volumes, 1 hour, 4°C) and proteins precipitated with trichloracetic acid (to 15%). The precipitate was washed with cold acetone and dried. The total NaCl soluble fraction (200 mg. dried weight) was extracted with 20 ml of 0.05M ammonium bicarbonate by stirring overnight at room temperature. The pellet was separated by centrifugation at 17000 x g for 10 minutes, washed twice with 0.05M ammonium bicarbonate and freeze-dried. The pellet was extracted with 20 mls of 70% (v/v) ethanol by stirring overnight at room temperature and centrifugation, washed and freeze-dried as above. The pellet was dissolved in 10% (v/v) acetonitrile in water containing 0.1% (v/v) trifluoracetic acid and applied to a Nucleosil C4 column and eluted with a linear acetonitrile gradient from 28%-34% with 0.1% (v/v) trifluoracetic acid at a flow rate of 1.0 ml/minute. Protein containing fractions were identified by SDS-PAGE and lyophilized. Nakase et al. (1996)  soaked rice seeds in phosphate buffered saline and sonicated them for 30 minutes. After centrifugation, ammonium sulphate was added to the supernatant to 50% saturation. After centrifugation, the precipitate was suspended in H2O and dialysed against H2O. After centrifugation, the pellet was disolved in 20 mm Tris/HCl, pH 8.0, containing 0.1 M NaCl, chromatographed on a DEAE-cellulose column (2.7 cm diameter, 30 cm length, DE-52, Whatman) and eluted with a linear gradient of 0.1-0.5 M NaCl. Alpha-globulin containing fractions were identified by SDS-PAGE, pooled, dialysed and lyophilized. Fiocchi et al. (2003)  and Musken et al. (1991)  report a 25 - 28 kDa IgE binding protein band which may correspond to the alpha-globulin. Nakase et al. (1996)  showed that the sequence P29835 (described as the 19 kDa alpha-globulin) contained errors and that the sequence from the clone is identical to P93414, the 26 kDa alpha-globulin. This does not explain why the 19 kda mature protein runs on SDS-PAGE systems at 26-28 kDa. Nakase M., Hotta H., Adachi T., Aoki N., Nakamura R., Masumura T., Tanaka K., Matsuda T.
Cloning of rhe rice seed alpha-globulin-encoding gene: sequence similarity of the 5'-flanking region to those of the genes encoding wheat high molecular-weight glutenin and barley D hordein. Nakase M, Alvarez AM, Adachi T, Aoki N, Nakamura R, Matsuda T.
Immunochemical and biochemical identification of the rice seed protein encoded by cDNA clone A3-12. Allergen properties & biological function:Glyoxalases-I and -II are ubiquitous enzymes which may serve to detoxify methylglyoxal produced from triosephosphates (Espartero et al. 1995) . They may play a critical role in defence against glycation (Thornalley PJ et al. 2003) . Allergen purification:Polished rice grains were extracted with 1M NaCl with sonnication and the extract separated by centrifugation at 10,000xg. The protein was precipitated by addition of 70% ammonium sulphate and dialysed against 20mM Tris-HCl, pH 8.6. The extracted proteins were then fractionated on DEAE ion exchange chromatography and the proteins eluted with a 0-0.5M NaCl gradient . Fractions reactive to IgE were dialyzed against 20mM Tris-HCl, pH 8.6 and chromatographed on DEAE-5PW. The proteins eluted with a 0-0.25M NaCl gradient (Usui et al 2001 ). Espartero J, Sanchez-Aguayo I, Pardo JM. Molecular characterization of glyoxalase-I from a higher plant; upregulation by stress. Glyoxalase I--structure, function and a critical role in the enzymatic defence against glycation. Tada et al. (2003)  list other sequences. Process, chemical, enzymatic:This protein has high heat stability, the allergenic activity being reduced by 50% following heating to 100°C for 60 min. (Matsuda et al 1988 ) . Allergen properties & biological function:The deduced amino acid sequence of the 'rice allergenic protein (RAP)' showed a considerable similarity to barley trypsin inhibitor and wheat alpha-amylase inhibitor. It is primarily located in the endosperm of rice (Matsuda et al. 1988 ). The protein is one of a multigene family and several members have been identified which are all allergenic (Nakase et al 1996 ). Allergen purification:The first allergenic alpha-amylase to be purified form rice was a 16,000 dalton protein (Matsuda et al 1988 ). Polished rice grains were extracted with 1M NaCl with sonnication and the extract separated by centrifugation at 10,000xg. The protein was precipitated by addition of 70% ammonium sulphate and dialysed against 20mM Tris-HCl, pH 8.6. The extracted proteins were then fractionated on DEAE ion exchange chromatography and the proteins eluted with a 0-0.1M NaCl gradient (Nakase et al 1996 ). Tada et al. (2003)  produced transgenic rice plants with antisense genes aimed at supressing the expression of proteins of the rice allergenic protein family. None of 100 transformants reduced the expression below 20% of levels in non-transformants. They reviewed the level of similarity between 12 members of this family and show evidence from immunoblotting that supression of expression depends on close sequence similarity. Yamada K, Urisu A, Komada H, Inagaki Y, Yamada M, Nakamura R, Torii S.
The involvement of rice protein 16KD in cross-allergenicity between antigens in rice, wheat, corn, Japanese millet, Italian millet. Izumi H, Sugiyama M, Matsuda T, Nakamura R.
Structural characterization of the 16-kDa allergen, RA17, in rice seeds. Prediction of the secondary structure and identification of intramolecular disulfide bridges. Izumi H, Adachi T, Fujii N, Matsuda T, Nakamura R, Tanaka K, Urisu A, Kurosawa Y.
Nucleotide sequence of a cDNA clone encoding a major allergenic protein in rice seeds. Homology of the deduced amino acid sequence with members of alpha-amylase/trypsin inhibitor family. Alvarez AM, Fukuhara E, Nakase M, Adachi T, Aoki N, Nakamura R, Matsuda T.
Four rice seed cDNA clones belonging to the alpha-amylase/trypsin inhibitor gene family encode potential rice allergens. Adachi T, Izumi H, Yamada T, Tanaka K, Takeuchi S, Nakamura R, Matsuda T.
Protein, Nucleotide Gene structure and expression of rice seed allergenic proteins belonging to the alpha-amylase/trypsin inhibitor family. Tada Y, Akagi H, Fujimura T, Matsuda T.
Effect of an antisense sequence on rice allergen genes comprising a multigene family.